Reigning Maui Interscholastic League girls volleyball Player of the Year Talia Leauanae (left) of Kamehameha Schools Maui and three-time MIL All-Star Shaina Rapanot-Uyechi of King Kekaulike smile as they sign their National Letters of Intent during a signing ceremony at Erdman Athletic Center in Olinda on Tuesday evening. Leauanae signed with the University of Alaska Anchorage, the 2016 and 2017 NCAA Division II national runner-up. Rapanot-Uyechi signed with the U.S. Air Force Academy, where she plans to become a pilot. 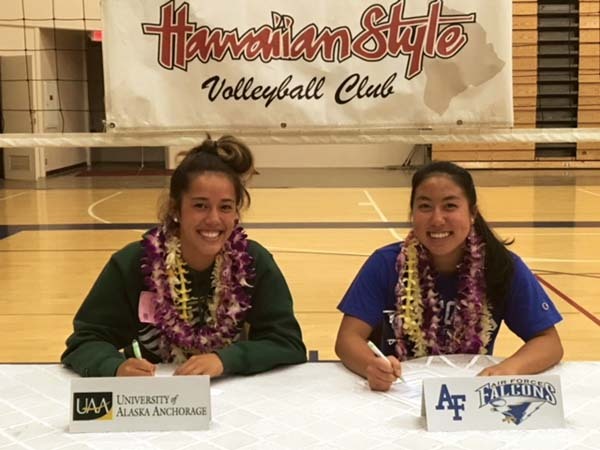 Both student-athletes, who accepted full-ride scholarships, have played with Hawaiian Style Volleyball since the 5th grade.